What if your every agent, could be your best agent? What if your agents didn’t need to ALT_TAB through 15 applications on the desktop? What if your agents didn’t have to “copy and paste” between applications? What if any agent could handle any call? What if your agents did no need to search for answers? What if quality and compliance was a natural part of agents work and not an afterthought? What if your agents could follow the right process, just as you had envisioned it? What if you could translate your ideas, adapt to change, in a short period of time? What if you could measure and achieve your Cost, Satisfaction and Revenue goals? What if you didn’t have to spend months and months on agent training? The crocodile Dundee school of management says that you just have to move fast enough to outrun your competitors. How do you know how you and your competitors are doing in offering a good service experience? One easy way is use a customer service maturity model, and benchmark you and your adversaries against it. Maturity models are industry-standard models that focus on organizational and process maturity instead of actual technology used. They let you rank your service offering on many different dimensions which include the efficacy of communication channels used, the self-service experience, the agent experience, the management of content across channels, and governance programs in place that allow you to coordinate and roll out new initiatives. Each of these dimensions has a list of capabilities that you use to benchmark yourself against a scale of 1 (ad-hoc capabilities) to 5 (mature, adaptive). 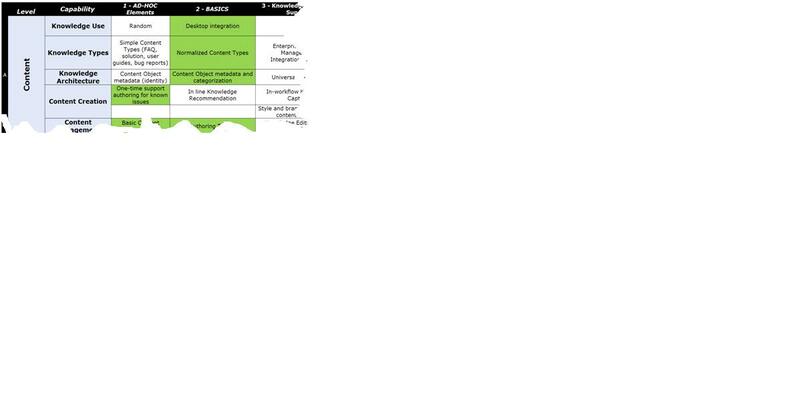 Here’s a snapshot of part of a maturity model. 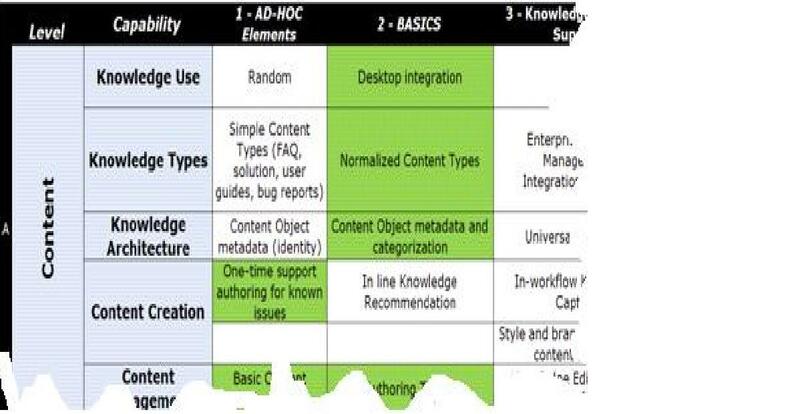 The green boxes indicate the maturity of the customer service organization. You should also do this with your competitors. You will only be able to benchmark them on visible dimensions (for example their self service offering vs their agent experience). Yet, you will be able to easily see if and how you are outrunning your competition. We all know that the voice of the customer has disrupted the tight control that companies have on their brand. Bad experiences are easily amplified and heard round the customer community. Think of stories like Dell Hell and Yours is a very bad hotel . The fallout is that 55% of customer don’t want to talk to customer service reps anymore (Forrester, 2008) and 90% of shoppers trust community input more than your company’s input (Neilsen 2009). So, what does that mean for customer service? You now need to engage your customers in a collaborative environment, which melds community and company recommendations, and is as transparent as possible to your customer base who demand honesty as they ultimately control the conversation with you. Your customer-facing web self-service site must include community content as well as corporate content, and your user base must be able to express their voice on your site. Your search results are social – You let the community dictate important content on your web-self service site. If a user chooses to interact with a customer service agent, your agents must have all the data and knowledge that they need to solve their issue pushed to them at the right point in the resolution cycle. You must extend business process management to customer service so that agents solve issues in a consistent, reproducible way that doesn’t vary from agent to agent. Your agents need to be cognizant of your customer’s emotion and satisfaction with the service process, and react appropriately so that the service experience keeps them loyal. You need to monitor, measure how you do, and use data, including customer feedback to tune your service experience to be aligned with customer demands. In what other ways can you evolve customer service offering into providing an experience? The most important thing to remember when selecting Customer Service software is to choose an offering that supports your company’s brand perception. It is not the goal for all companies to offer the most ideal customer experience that vendors try to sell you. For example, the expectations of users of a discount airline is not “over-the-top” service, but service that is streamlined, and heavily reliant on web self-service and email. On the other hand, a luxury retailer’s service offering is very different – It should be white-gloved service, reliant on personal contact that is tailored for a particular customer. In evaluating Customer Service software you must also understand your customer’s demographics, and their communication channel requirements as baby boomers for example, have very different communication needs that the more tech savvy Generation Xers and Y’s. Finally, you need to understand the communication channel requirements that your company can afford as channel costs differ widely. Web-self service and email costs are typically a fraction of those for the “live assist” channels of chat and phone. Irrespective of the communication channels that you can support now, you must architect your offering so that channels are not siloed, that corporate knowledge is shared and that alternate channels can be added at a later time as the need arises. Once your Customer Service system is implemented, you need to measure its efficacy and tune it using a balanced scorecard approach. You need to measure key performance indicators – for example, the cost of delivering customer service against the satisfaction of your customer base, the compliance of agents to company policy and generated revenue. These measures then need to be mapped to the overall customer perception of your company to ensure that the chosen Customer Service systems are supporting and not eroding your brand image. And finally, you need to be agile enough to change your service offering based on customer feedback and the gathered metrics. KANA historically has had two blogs: this one, and Speak Out . Evolved Thinking’s charter has been to provide a forum for Practice Leaders to share their perspectives on customer service and support trends, self-service best practices, Web 2.0, knowledge management and other topics central to improving customer service delivery. Our other blog, Speak Out, provided KANA’s executive management with an outlet for sharing their insights regarding the emerging technology category of Service Experience Management. Next week we will be folding the Speak Out blog into this one. This means that you will see more posts and a broader variety of contributor voices, like those of KANA’s CEO Mike Fields and CTO Mark Angel. The focus of this blog will remain unchanged, and we encourage you to keep reading and commenting. What topics are you interested in hearing our point of view? Please let us know and we will consider them as our charter evolves. Customer service. We know that it is not one size fits all – it is the art of aligning your service with your brand. It’s the consistency of experience that a customer feels every time they interact with you. And what is brand? It’s what you stand for, it is how you differentiate yourself. Bruce Temkin from Forrester blogs a lot about this. We seem to agree that not all companies need to provide exceptional customer service – just good enough service that is in-line with their brand. Think back to the IKEA and Apple examples in my last blog. But what about industries where there is little differentiation between products and services? Like banks or telecom providers? Is there any true difference between the banking products and services at Wells Fargo, Citibank, or Bank of America, just to name a few? They also offer an undifferentiated customer service experience that makes it hard to for you, as a customer, to individualize them. One deviator in the banking space is ING Direct. They are a non-traditional, internet bank where all business is done via web self service, ATM or email. They have no branches, and you cannot visit a live agent. Even without this traditional personal touch, they know who their customers are, what they want, and deliver what they need. Everything about the banking experience is slick, comprehensive and targeted to a good customer service experience. However, they only target the tech savvy customer with relatively straightforward banking needs – they are known to fire “high maintenance customers” who do not fit into their service mold. ING Direct, in a sector of undifferentiated products and services, differentiates themselves by their exceptional service experience. This experience is aligned with the bank’s business model. And this service differentiation becomes their brand. Once again, service = brand.